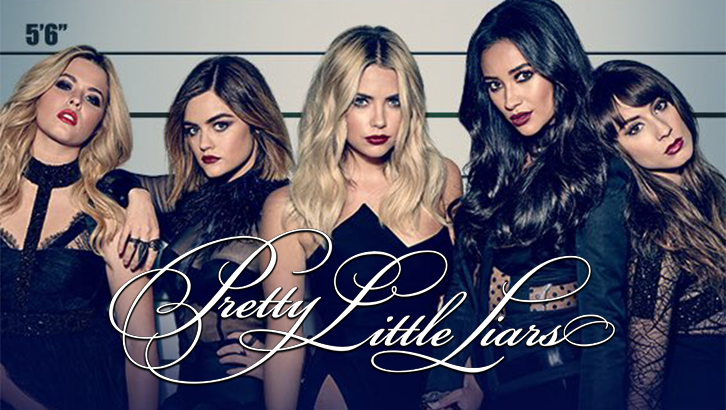 Pretty Little Liars - Wanted: Dead or Alive - Review: "So That Death Was LOL"
7.06 - "WANTED: DEAD OR ALIVE"
Click on an episode title to be taken to the review of the episode. Episodes 1-13 were reviewed by Jasmine Alyce. Click on a title to be taken to the review for that episode. Episodes 6-8 were reviewed by Kate Sidwell. Click on an episode title to be taken to that review. Episodes 2-3 were reviewed by Kate Sidwell. Another week, another episode, and for this one we had to wait 2 weeks for! Fortunately, to me, it was worth the wait - there were so many scenes that I really enjoyed: Spencer and Mary at the Resort, Hanna telling Aria she called it quits with Jordan, Emily in Jenna's hotel room, Alison's fight with the fake police officer... and of course, that major LOL at the end with Sara's death. There were some good and bad decisions made by the Liars in this episode, which makes it less infuriating than previous instalments in the seventh season, so that's a major bonus when discussing Wanted: Dead or Alive. I'm also glad at how the Spaleb relationship came to an end with a mutual understanding and it didn't end with Caleb pitifully ditching town to avoid confrontation. Solid effort, Liars writers! 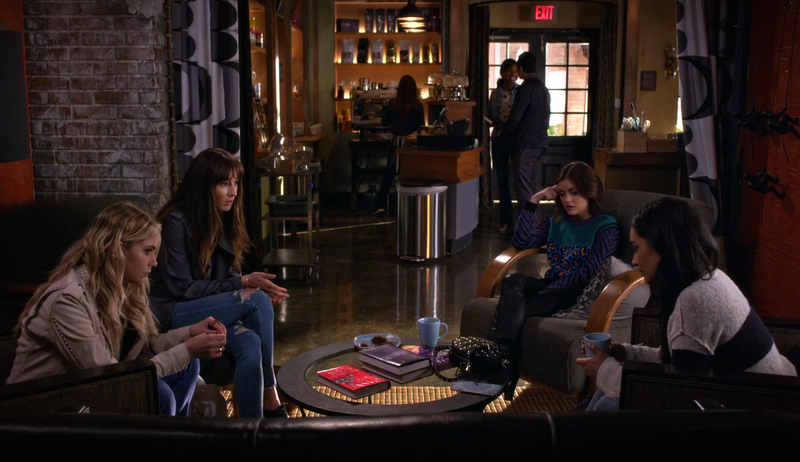 Spencer had a really great episode, which helps a great deal when she was so underused in the last one. I always love when she has a conversation with Mary Drake - we always learn quite a lot from it. It's so hard to read Mary, I honestly don't know when she's lying or telling the truth, but the actress is so great she makes me want to believe her. 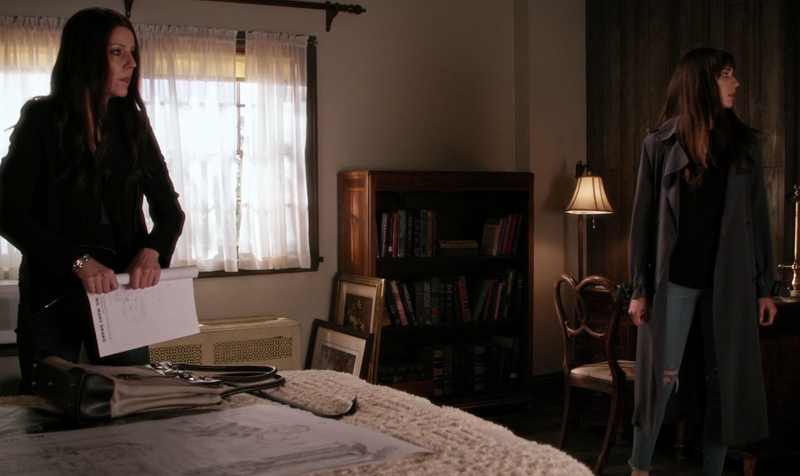 I also found it hilarious that Mary handed Spencer the crowbar when they heard the noise. Isn't Mary supposed to be the bigger adult here? Haha. It's worth mentioning the Spaleb break-up, because fortunately it happened in a way I liked. No bitter feelings, no unnecessary drama. There was emotion, for sure, and it was nice to see Spencer realise that she needed Caleb to sort of jump-start the heart that stopped pining for love when she broke up with Toby. As much as I liked their chemistry, it was time to call it a day. Spencer deserves better (not saying that Caleb isn't great, but Spencer is never going to be his priority ever). Aria only had her romance story in this episode, which was rather unfortunate. She spent a lot of time dealing with the main juice of the plot in the last episode, so it was a bit of a step back to see her ponder a question all episode long to come to the conclusion we all knew was coming. It kind of shows that Ezra really is a distraction for her, which is kind of why I feel a bit torn about this engagement. One, I know a lot of people find it inappropriate (and I understand), but two, it takes away whatever character development there is to Aria. While I'm hoping that now she's 'bagged' her man, she can just get stuck in with the important parts of the show rather than spend an entire episode wondering. Not that fun to watch when she's like this. Don't let this dominate her entire existence writers (though it may be too late), but please let her be able to do things herself too. Don't let this hold her back! Hanna has been gradually fading since her big kidnap at the start of the season, and the accidental killing of Rollins. Her quieter side is dominating the sassy Hanna we all know and love, and in this episode, she didn't do an awful lot. That's kind of good in a sense, because we get more of a glimpse in her psychology and how all of these events are taking its toll on her. It was great to see her come clean about her engagement with Jordan to Aria, and her advice was very heartfelt and sincere. A Hanna six seasons ago would not have been so wise. I especially loved when she and Spencer had to make sure that Rollins is dead after Alison was attacked. I love it and hate it, in a way. Love, because I hate when they assume something without checking, so I'm glad they went and did their research before concluding that Rollins was alive. Glad they definitely know he IS dead. But also hate, because they were stupid enough to do it when they're being watched by a new A - so being filmed has really put them exactly where they shouldn't be... in Uber A's hands. Those maggots are sooo fake. I am rather surprised Alison wasn't more pissed at the girls for basically turning her over to A.D. 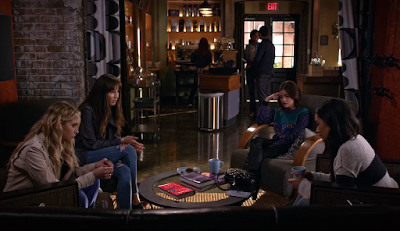 I did like how she confronted the girls at the start of the episode, leading to a good scene with Spencer. Have I mentioned how much I do love Alison this season? She just feels so mature now and just the way Sasha is playing her is fantastic. Anyhow, we all knew the police officer was wearing one of those masks. Is it just me, or did the production team try and make the masks look more 'realistic' by making them a little 'fake' (because come on there's no way a mask can change a face completely like it did with Rollins as Wilden), but that in turn just made it look so fake that Alison really should have seen how fake the policeman's face was. The 'Honey I'm Home' was a creepy touch before the attack, and while I would have liked a bit of a longer scene, I'm happy with what we got. Poor Alison really got it. One of the better episodes in 7A, with a handful of scenes that really stood out. The death was great, because I really wanted it to happen for like the longest time, and some of the characters had better material than the last episode (looking at you Spencer). Prettiest Little Liar: Emily Fields (she never seems to win this anymore, so I thought why not). Most Sympathetic Character: Hanna Marin. Favourite Episode Pairing: Spencer and Hanna. 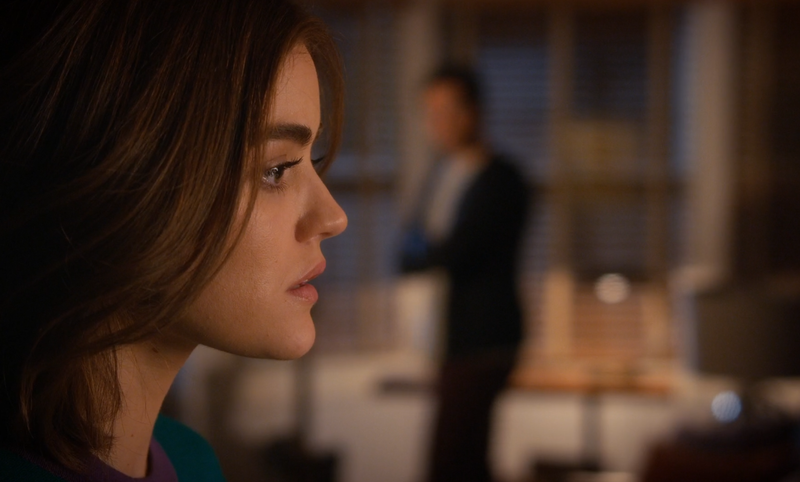 Best Line: "I can't promise Ezra forever when my future could be spent behind bars." - Aria Montgomery. Best Moment: Spencer and Hanna dig up Rollins' grave, only to find he is still in there with maggots galore. Saddest Moment: Hanna admits she ended things with Jordan. Creepiest Moment: Alison's fight with the fake police officer. Runner-up: Spencer and Hanna are filmed digging up Rollins' grave. Shadiest Moment: Jenna stopping Sara from telling Emily who she should be afraid of. Funniest Moment: Sara is found dead in the shower because LOL, irony. Damned Disappointment: We didn't see Sara die. Biggest Question Mark Award: Who killed Sara (probably Jenna or she got someone to do it)? Biggest ReveAl: Rollins IS dead - glad they didn't drag that one out. What did you think of Tuesday's episode? Did you love it? Hate it? Let me know your thoughts on the episode in the comments and tune into the next episode, airing on Freeform on August 9th! Award-winning author of the 'Abyssal Sanctuary' series. 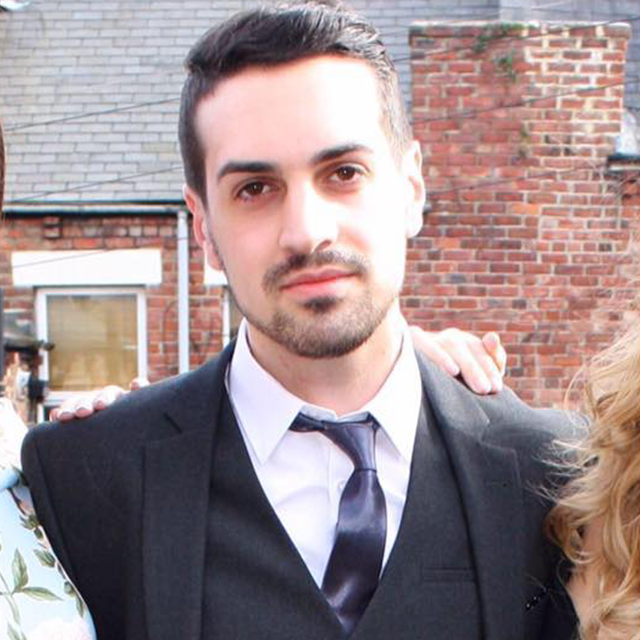 As Senior Staff, Gavin joined SpoilerTV in August 2014 and reviews Dead of Summer, Devious Maids, Mistresses, Pretty Little Liars and Salem. Gavin will write previews for Empire and Shadowhunters, and backs-up Once Upon a Time, Reign and Scandal. Gavin also writes special anniversary articles, most recently Charmed. You can contact him at gavin@spoilertv.com.